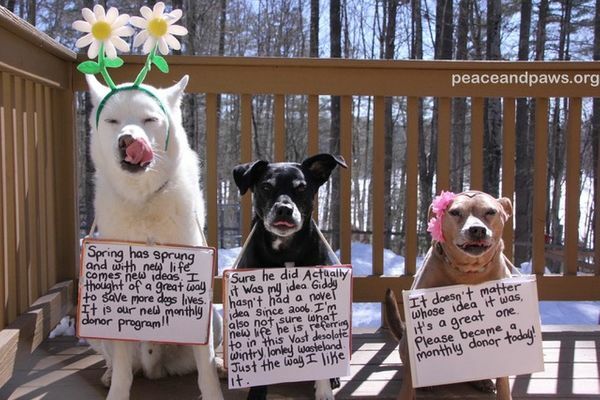 Happy Spring... Why not celebrate by giving new life to rescue dogs by becoming a monthly donor? CLICK HERE to Become a MONTHLY DONOR Now! we’ll receive $5,000 in matching gifts from an anonymous donor. That’s .0011 % of all of our friends on Facebook. Literally save dogs’ lives all year long. It's flexible. You can increase, decrease, or cancel your monthly gift at any time, without obligation. It's convenient. You sign up once, and your gift is automatically withdrawn each month on the same day. Set it and forget it. It allows a ‘smaller’ gift to become a larger one over time without straining your budget. Turn your values into action. Inspired by your love for dogs, your monthly gift is turned into practical action, supporting Peace and Paws rescue, rehabilitation, education, and advocacy work. It makes you a friend dogs can depend on. When you stand up for rescue with your monthly gift, you make a commitment to dogs, spay/neuter education, veterinary care and more. You become a champion they can count. It's green. You will receive only electronic communication with your monthly gift. You’ll help protect the planet as you help save dogs. No gift is too small! Whether you contribute $5, $20, or $200 a month, it all adds up to a truly meaningful commitment to our rescue dogs. Your monthly gift provides us the financial foundation we desperately need to save the lives of more dogs. All gifts are tax-deductible. $25 a month = $300 a year pays for obedience classes for 2 dogs. $30 a month = $360 a year pays for preventative care for 20 dogs.